T-L Photo/KIM NORTH RICK CROSIER was honored as the 2019 Larry Deaton OVAC Official of the Year prior to the start of Friday night’s action at the 66th annual Ron Mauck OVAC Wrestling Tournament at WesBanco Arena. From left are Steubenville head coach Mike Blackburn, Crosier, Deaton and long-time official Jack Regis. 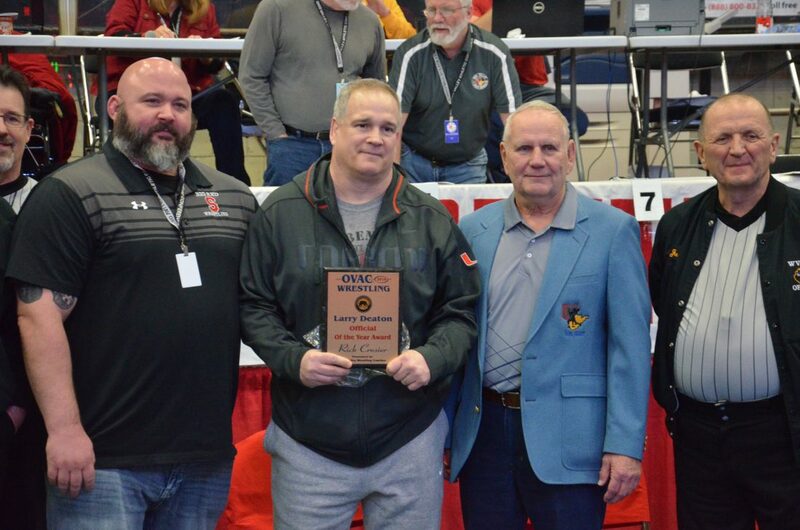 WHEELING — Rick Crosier was named the 2019 “Larry Deaton OVAC Official of the Year” prior to the start of Friday night’s action at the 66th annual Ohio Valley Athletic Conference Ron Mauck Wrestling Championships. The award is presented by the OVAC Wrestling Coaches Association. It marks the second time the Steubenville native has been honored as such, but this time it means a whole lot more to Crosier. “Tonight is really special to me because the health problems I’ve been going through,” Crosier said. “I had bladder cancer they totally rebuilt my bladder. Hopefully, when I go back to the doctor in a month or so, then I’ll be done with that. That chapter will be put behind me and I can anew and living normal again. Crosier has been officiating wrestling for more than three decades, but it all started as a wrestler . Under the tutelage of legendary high school coach John Craig at Steubenville High, Crosier compiled a record of 105-11-1 and was a two-time OVAC champion his junior and senior years. He was also a four-time district champion and third in the Ohio State tournament his senior year in 1981. As a “Hilltopper” wrestler for legendary college coach Vince Monseau, he was a two-time All-American, placing fifth his junior and senior years for West Liberty University. Crosier was previously named the “OVAC Official of the Year in 2004 and 2011” for his outstanding skills as a mat arbiter. Crosier and his wife, Kristen, have two wonderful children – Kasey and Zachary. They reside in Steubenville. However, her dream of placing as a freshman was not to be as she was eliminated Friday night.